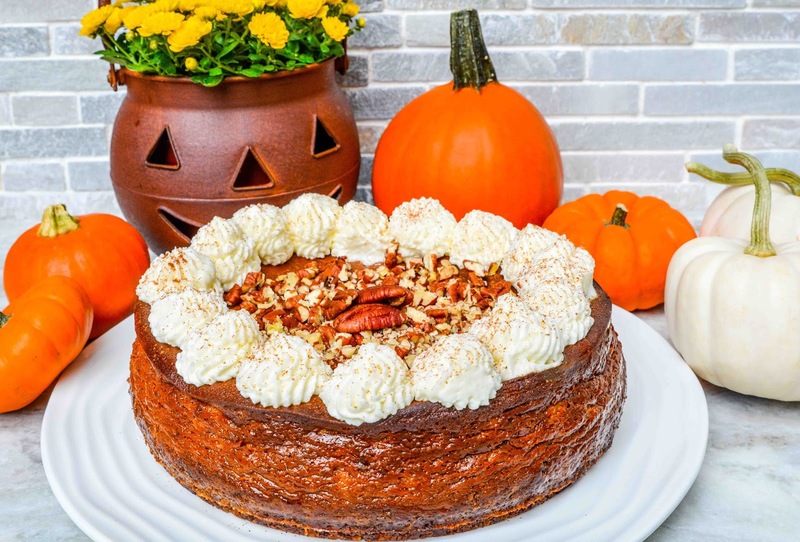 Theresa's Mixed Nuts: Hello Pumpkin Cheesecake! You guys ever see those humongous pies at Costco? Of course you do. They're so big, it's hard not to notice them. So, imagine my delight when I spotted the first of their pumpkin pies of the season on the shelves last week. Those impulse buys always get me, but I was more than happy to fork out the extra cash to get my pumpkin fix in. My delight was short lived though, because the next day I woke to find mold rings starting to sprout on my beautiful pie and the whole thing had to be trashed. I know, I could have taken it back to the store for a refund, but I probably would have spent more in gas than the pie was worth. Instead, I decided to make my own pumpkin flavored dessert from scratch, something I knew wasn't going to go bad in less than a day. I pulled up this Pumpkin Cheesecake from Golden Blossom Honey and set to work whipping up the most delicious fall dessert one could ask for. Yes, I am a basic white girl who loves pumpkin spice everything, and I could live off of cheesecake for the rest of my life, so when you combine the two, I'm in sweet tooth heaven. 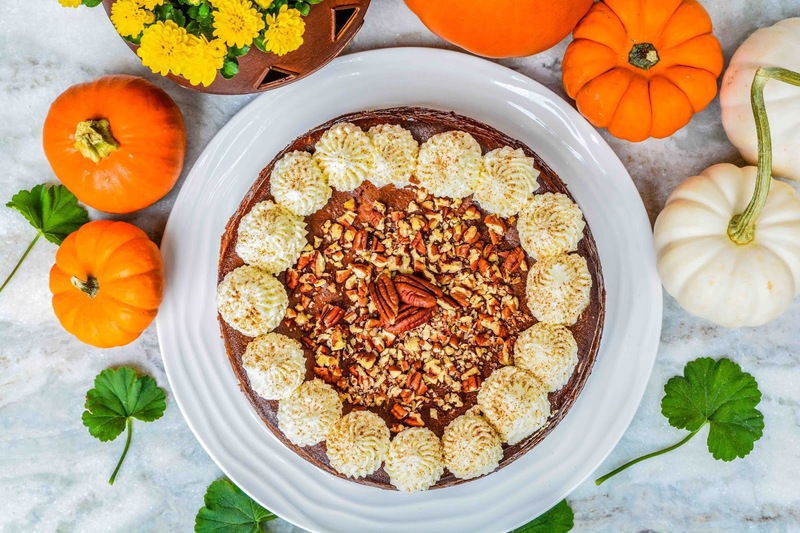 This rich, creamy dessert is packed full of the flavors of fall you love, it will be hard to resist eating more than one slice. But if you do go back for seconds, that's cool. I won't judge. What's your favorite pumpkin flavored dessert? Doing your own sure looks to be the way. No mold is a win any day. That's probably what they are banking on, not worth the gas, so we'll screw over her and many other in mass. Lesson learned that do it yourself is always the way to go. Pumpkin spice is the same as Christmas spices, right, cinnamon, cloves, nutmeg and such things? I do love the white little pumpkins, I'd decorate the whole palace with them instead with the orange ones. I've bought a pumpkin myself last week, but for a savoury soup. I'd eat it more often if I did not hate peeling and cutting it so much. Talking about cookies, we recently started getting your Oreo here, it's expensive, but I tried it and I was totally disgusted. I expected something heavenly. It was utter garbage, too dry, to tasteless, to bitter, too nothing. I will be returning to domestic coconut, lemon and speculaas cookies, methinks. Yes, it's the same as Christmas spices, though I don't use them often in my holiday baking. White pumpkins are my favorite too. They just add a touch of elegance to home decor. I have never been a fan of eating Oreos straight, but I think they are fabulous for pie crusts. Crush them up, mix in some melted butter and you've got a yummy pie crust perfect for peanut butter pies and cheesecakes. If I want a cookie, I always go for sugar, peanut butter, or the classic chocolate chip. We were without power last night too, but it's because Jason accidentally drilled though a wire in our bedroom. Whoops! We're remodeling it (finally!) and every time we do a new room, we find some half assed wire job the previous tenants did. I'm surprised our house hasn't burnt to the ground yet. Ooooh, you know we do expect photos of the new bedroom! Photos, photos, photos! What are you doing with the bedchamber? Whatever did they do back in the days before power? It's funny how angry we get when we have to make do without it. I ended up blowing a fortune on a power generator because where we live, the power goes out A LOT (I mean, like twice a year for up to 5 days at a time!) Well worth the investment! I am extending my closet by 2 feet to make it almost like a walk in closet. I am going to put sliding barn doors on the outside of it. I ripped out one wall and put up shiplap boards that I will paint white to give it a rustic, shabby barn feel. We will be sanding down the rough walls, then giving them a coat of gray paint. We also bought new furniture because ours was bought at the discount store 20 years ago. It was well past time to upgrade! I do remember living without power and water since we went through wars, bombings, poverty and political embargo, we used to play cards or we'd just go to sleep earlier. But mind you, those were days without the internet so we did not miss what we did not have. I was only always afraid back in those days that power shortages would ruin the food in the freezers and fridges and that I will have to bathe in cold water. But I'd always remember how there were babies dying in hospitals because they had no electricity for incubators, and I'd just grit my teeth and suffer my lesser problems bravely. I'm glad you have generator, it must be a super cool thing to have especially in the country of tornadoes and snowstorms. Oooh, new bed, I'm ever so excited! You should take down the wall to Mariah's room and turn it into a bathhouse for yourself :) /ebilgrin/ your own little spa LOL Can't wait to see the final result! Oooh, what will the colour be! Yes, there's always someone worse off then we are, and when you think about that, it really puts everything back into perspective. We were going to rip out our 4th bedroom which is attached to the master bath and make it one big bathroom, but in the end we figured 4 bedroom would have a better resale value than an oversized bath. that's pretty much the same colour scheme in my room as well! Ahh, fall. Pumpkin everything is back and in full effect! I've actually never had pumpkin cheesecake, so I can't wait to make this. Gotta love fall and pumpkin flavor everything! I cannot wait to make this! I love to cook with honey, and this time of year, I get into the pumpkin recipes VERY heavily. This is going on the list! I like baking with honey too. It always makes the finished baked good moist and delicious! OMG - this is going to be saved, and baked VERY SOON. Pumpkin and cheesecake...two of my favorites!!! So...this my friend, this is my favorite pumpkin flavored dessert!! YUM!!! My mom also fixes a pumpkin bread with cream cheese frosting - yum! Absolutely - I'm thinking that this will be my dessert contribution to Thanksgiving this year...along with the pecan bars. Those have become a family favorite...and one my best friend has requested since. Lol!! Aren't those pecan pie bars sinful? I could seriously eat half the pan in one sitting. I never understood people who don't like pecan pie. This does look wonderful! Perfect for this time of year all the through Thanksgiving. Oh my goodness how awesome does this sound, I have only recently started loving cheesecake and I definitely need to try pumpkin! Oh my heaven! This sounds so delicious. I think I want this for Thanksgiving this year! We love cheesecake, but have never tried pumpkin cheesecake before. This sounds like a yummy recipe. That pumpkin cheesecake looks amazing. I can't believe that it isn't pumpkin season already. 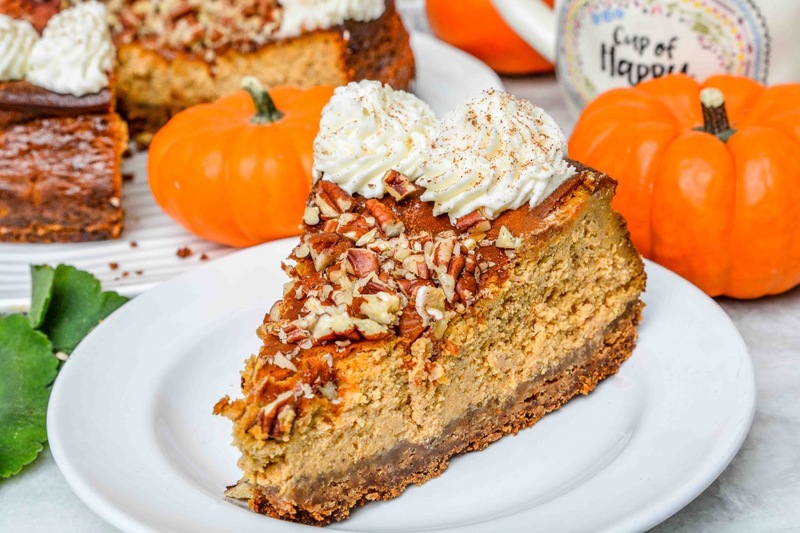 Yes to cheesecake and pumpkin put together in one lovely dessert! I can't wait to try this recipe as I love both! Thanks for the idea! It would be nice to serve this on Thanksgiving. Wow! My mouth is watering! This looks so fabulous! I have never had a pumpkin cheesecake. I have got to make one. Oh this sure sounds delicious. A perfect fall treat... of course honey works anytime of year and for so many things. I just added it to my tea before I sat down to catch up on some reading. It sure does look delicious, and you found little pumpkins already!! I haven't seen them yet! Glad you made a dessert to replace the one from the store that was ruined (boo to that!). I've been looking for mini pumpkins everywhere! Finally found a few at Meijer. They should be hitting all the stores soon though. This is THE best Fall dessert! It's texture perfect for those cool days approaching and the color! These pumpkin cheese cake is looking delicious. I can't wait to taste it. If you like pumpkin pie and cheesecake, then girl, this is for you! That pumpkin cheesecake looks gorgeous, Theresa! I must try this recipe when I get home from Victoria. I tried one several years ago, and it split while baking. Baking at 6,000 feet is such a challenge. Pumpkin everything is turning up, and it's one of my favorite flavors. Have a good one! It makes me so sad when they split, but I am sure yours was still quite tasty! I would love to come to NY and get some authentic NY Cheesecake! I bet it can't be beat! Oh goodness! If you lived close by, I'd be at your house every day to eat. You create the best foods. I am a sucker for pumpkin and cheesecake too.